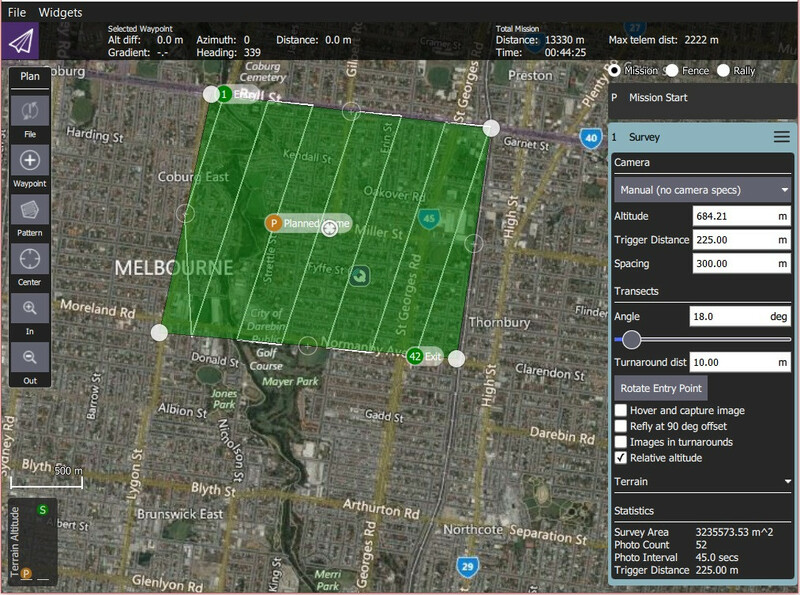 A survey allows you to create a grid flight pattern over a polygonal area. 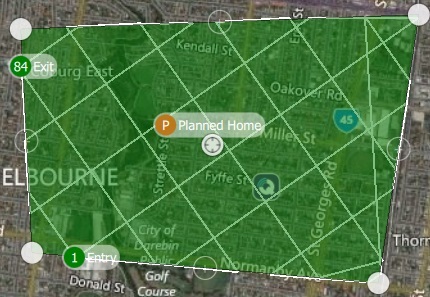 You can specify an arbitrary polygon, the angle and other properties of the grid, and camera settings appropriate for creating geotagged images. 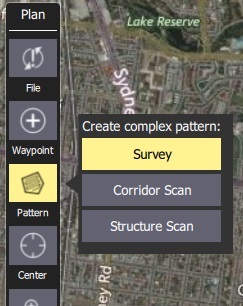 Choose the Pattern Tool from the Plan Tools and then select Survey. This will add a survey grid to the map, and a Survey item to the mission list (on the right). On the map drag the vertices to the change the shape of the polygon. Click the (+) symbol between existing vertices to create a new vertix. The new vertix can then be dragged into a new position. The survey settings are covered in the next section. The survey can be further configured in the associated mission item (in the mission item list on the right hand side of the Plan View). Camera triggering behaviour depends on the camera/camera settings. 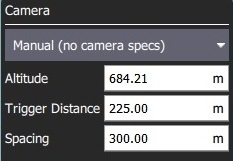 You can select an existing camera, custom camera, or manually enter the settings. The list of available cameras (QGC 3.4) is given below. 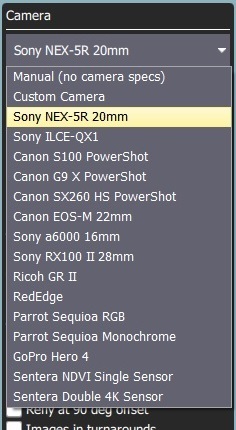 Selecting a known camera from the option dropdown generates a grid pattern based on the camera capabilities. Overlap - Overlap between each image capture. This can be configured separately for when flying along grid lines or across them. Selecting the custom camera option allows you to specify the settings for a new camera in a similar way to a known camera. 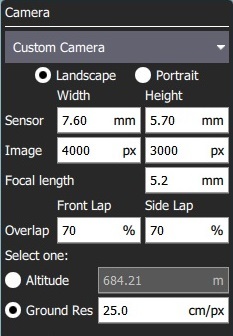 Sensor width/height - The size of the image sensor of the camera. Image width/height - The resolution of the image captured by the camera. Focal Length - The focal length of the camera lens. 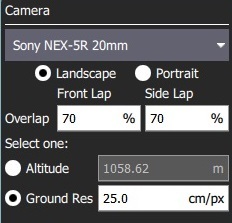 The remaining settings are the same as for a known camera. Altitude - Survey altitude to fly the whole grid. 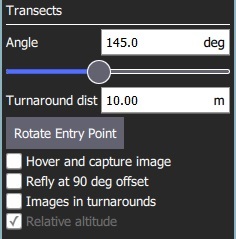 The Transects section is used for grid settings that are independent of the camera used. Angle - The angle of the grid lines, relative to North. Rotate Entry Point - Press button to swap the start and end point of the survey. Hover and capture image - Hover to capture images (multicopter only). Refly at 90 degree offset - Check to refly the whole mission at a 90% offset. Relative altitude - Check to ... TBD. By default, a flying vehicle will follow the survey path at a fixed altitude. Enabling Terrain Following makes the vehicle maintain a constant height relative to ground.